An accompaniment for the hymn tune ASSURANCE, best known as the hymn Blessed Assurance. Use this piece to accompany the last verse of the hymn. This setting can be played as a duet with our Organ Accompaniment of the same name. An accompaniment for the hymn tune AURELIA, best known as the hymn The Church's One Foundation. This title is designed to be used to accompany the last verse of the hymn. This setting can be played as a duet with our Organ Accompaniment of the same name. An accompaniment for the hymn tune AZMON, best known as the hymn O For A Thousand Tongues To Sing. This title is designed to be used to accompany the last verse of the hymn. This setting can be played as a duet with our Organ Accompaniment of the same name. An accompaniment for the hymn tune BROTHER JAMES' AIR, also known as How Lovely Is Thy Dwelling Place. This setting can be played as a duet with our Organ Accompaniment of the same name. An accompaniment for the hymn tune DENNIS, also known as Blest Be The Tie That Binds. This setting can be played as a duet with our Organ Accompaniment of the same name. An alternate harmonization of this hymn for use with congregational singing. This setting can be played along with our organ accompaniment setting in 3/4 meter. An accompaniment for the hymn tune GROSSER GOTT, also known as Holy God We Praise Thy Name. This setting can be played as a duet with our Organ Accompaniment of the same name. An alternate harmonization of this hymn for use with congregational singing. Compatible with the similarly titled organ arrangement. An accompaniment for the hymn tune HIGHER GROUND. This setting can be played as a duet with our Organ Accompaniment of the same name. An accompaniment for the hymn tune KIRKEN, also known as Built On The Rock, The Church Doth Stand. This setting can be played as a duet with our Organ Accompaniment of the same name. A piano hymn accompaniment with minimal alternate harmonization for use with congregational singing. Also known under the title Come Holy Spirit Dove Divine. This setting can be played along with similarly titled organ hymn accompaniment. An accompaniment for the hymn tune MERCY, also known as Holy Spirit, Light Divine. This setting can be played as a duet with our Organ Accompaniment of the same name. An accompaniment for the hymn tune OLD 100TH, also known as the Doxology and many other sets of lyrics. This setting can be played as a duet with our Organ Accompaniment of the same name. This piece includes two versions, the traditional and modern settings. 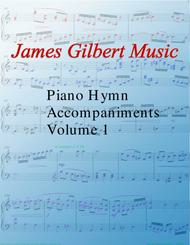 A collection of piano hymn accompaniments. These are designed to be played on the last (or next to last) verse of a hymn during congregational singing. Listed is the Tune name followed by the most common titles associated with that tune. Many hymn tunes have many different lyrics so check your hymnal to see if it uses different titles for the hymn tunes listed. New Title An alternate harmonization free improvisation of this hymn. Also known as Christ Whose Glory Fills The Skies. For use with congregational singing. An accompaniment for the hymn tune ST CHRISTOPHER, also known as Beneath The Cross Of Jesus. This setting can be played as a duet with our Organ Accompaniment of the same name.